Proceedings from the international conference on “Transformation in a Changing Climate” (19-21 June, 2013) are now available online. The proceedings include a selection of papers on issues related to economics; politics; technical and infrastructural changes; urban transformations; community-based initiatives; learning and leadership; social-ecological systems; values, norms and worldviews; research paradigms; communication. Some of these papers address larger questions related to the who, what, why and how of transformation processes, and others represents case studies of transformation in practice. They demonstrate the breadth of the field and the importance of bringing together different perspectives. 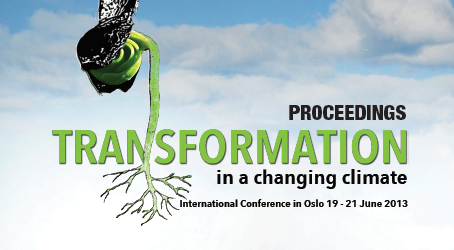 The conference “Transformation in a Changing Climate” was held at the University of Oslo, Oslo, Norway from 19-21 June, 2013. To see video clips from the conference visit the University of Oslo webpages. To download the Proceedings Transformation in a changing climate.